Rotating inserts can provide faster cutting speeds, longer insert life or both. They are outstanding in interrupted cuts. 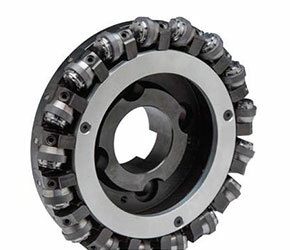 Instead of fixed inserts limiting productivity, rotating inserts can utilize the full power of the available spindle. With the addition of “wiper” inserts, Revomill’s can provide any surface finish customer specifications require. Results are based on the use of a 4 inch milling cutter. Call us at (800) 824-9697 or fill out the form below to receive our product information.